Emma is a little pit bull mix with a big personality — and even though a birth defect left her back legs completely paralyzed, this heartwarming video shows that her love is bigger than her disability. The video shows Emma excitedly hurrying over to the front door to welcome her military dad home from a 6-month deployment. 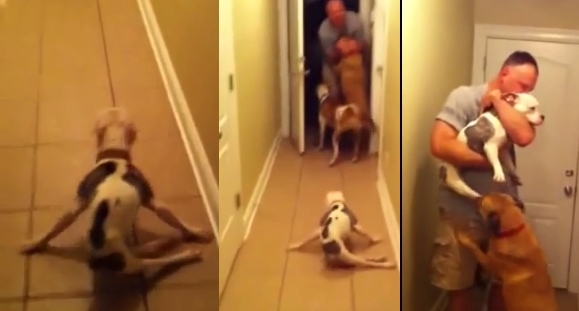 Responses to "Paralyzed Pup Finds The Strength To Welcome Her Dad (Video)"
Ummm... this poor little dog could use a cart! She looks miserable being so confined by her back legs. I'm sure it's not easy for her to move around all spread out like that, straining her front legs. Look at her expression... even though she's happy dad's home, she still looks sad! That is so amazing. That just shows how much she loves her human Daddy. Thank you for sharing this. Love knows no limits. The right meaning of the words civilisation and civilised. Respect to all of those people who really care and help the animals.This world needs more like them. I hope they can get one of those little buggys, that anonymous talks about, they are amazing! she will run circles around the other dogs & will be so happy, I'm going to take down the address of the company, and share it, so many little guys can use them.